Is Maya the same as Durga? ". . .the Brahma-samhita (5.44) says, sristhi-sthiti-pralaya-sadhana-shaktir eka chayeva yasya bhuvanani bibharti durga. Maya is like a shadow of the Supreme Personality of Godhead who serves Him in the creation, maintenance and annihilation of this world. Just as a shadow has no independent power of movement but follows the substance that casts the shadow, the illusory energy of the Lord has no independent power, but bewilders the living entities according to the Lord's desire. One of Krishna's opulences is that He is supremely detached; when a living entity wants to forget Him, Krishna immediately employs His illusory energy to facilitate the foolishness of the conditioned soul." "Actually, the illusory, material energy is cheating everyone. People do not know what they are doing when they worship the material energy in the form of goddess Kali or Durga for material boons. They ask, "Mother, give me great riches, give me a good wife, give me fame, give me victory." But such devotees of the goddess Maya, or Durga, do not know that they are being cheated by that goddess. Material achievement is actually no achievement because as soon as one is illusioned by the material gifts, he becomes more and more entangled, and there is no question of liberation." From the above we can understand that the internal and external, or superior and inferior, potencies of the Supreme Lord are personified as Yoga-maya and Maha-maya, respectively. The name Durga is sometimes used to refer to the internal, superior potency, as stated in the Pañcaratra: “In all mantras used to worship Krishna, the presiding deity is known as Durga.” Thus in the transcendental sound vibrations glorifying and worshiping the Absolute Truth, Krishna, the presiding deity of the particular mantra or hymn is called Durga. The name Durga therefore refers also to that personality who functions as the internal potency of the Lord and who is thus on the platform of suddha-sattva, pure transcendental existence. This internal potency is understood to be Krishna’s sister, known also as Ekanamsa or Subhadra. This is the Durga who was worshiped by the gopis in Vrindavan. Several acaryas have pointed out that ordinary people are sometimes bewildered and think that the names Maha-maya and Durga refer exclusively to the external potency of the Lord." 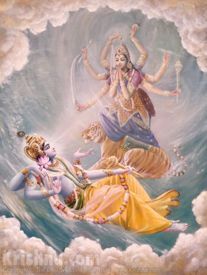 - the benefits of steering clear of Krishna's illusory energy. Where Do The Fallen Souls Fall From? - how maya works, and how we got into illusion in the first place. - more about how maya works, from "God Is Great And Sweet"
"Therefore this entire universe, which like a dream is by nature unreal, nevertheless appears real, and thus it covers one's consciousness and assails one with repeated miseries. This universe appears real because it is manifested by the potency of illusion emanating from You [Krishna], whose unlimited transcendental forms are full of eternal happiness and knowledge." "This divine energy of Mine, consisting of the three modes of material nature, is difficult to overcome. But those who have surrendered unto Me can easily cross beyond it." "Since Krishna is always engaged in His blissful pastimes in the company of His eternally liberated associates, He is aloof from the affairs of this world, which is created by His external potency, known as maya." Hare Rama, Hare Rama, Rama Rama, Hare Hare"
"The Lord is the seer, and the external energy, which is seen, works as both cause and effect in the cosmic manifestation. . . this external energy is known as maya or illusion, and through her agency only is the entire material manifestation made possible." - how to get free from maya's bewildering influence. If Krishna really wants us to be happy, why doesn't He let us eternally and completely control and enjoy maya?